India, Pakistan Stop For Crucial Cricket Game The neighbors and rivals are playing each other in the semifinal of ICC Cricket World Cup in Mohali, India. Tensions are high ahead of the "mother of all matches." Some 100 million viewers are expected to watch a broadcast of the game, which will be attended by the prime ministers of both nations. Pakistani captain Shahid Afridi (left) and India's captain, Mahendra Singh Dhoni, at a news conference in Mohali, India, on Tuesday. The two men and their teams will face off Wednesday in a World Cup semifinal that is being dubbed "the mother of all matches." Throughout the Asian subcontinent normal life is expected to come to a standstill Wednesday. 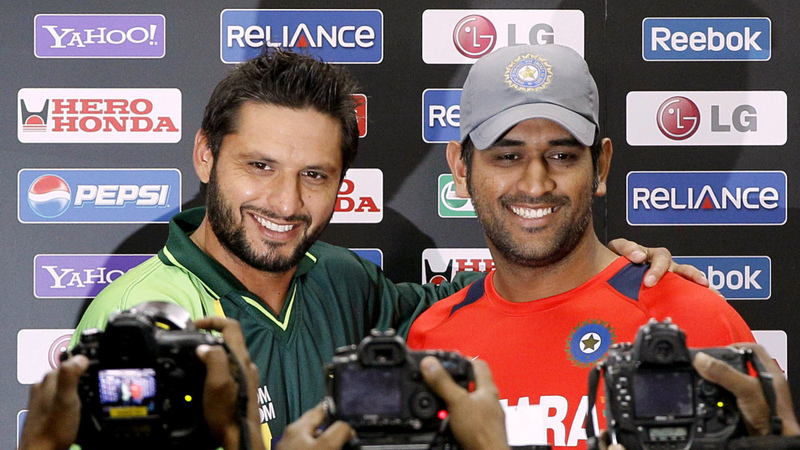 The semifinal of the ICC Cricket World Cup features an unrivaled rivalry: India vs. Pakistan. Some 100 million viewers are expected to watch a broadcast of the match from Mohali, in the Indian border state of Punjab. Defeat for either side is not an option. Suspicion between the two countries, which have gone to war three times, is so intense that it's normally a grueling process for anyone from Pakistan to get a visa for India or vice versa. But India granted 5,000 visas to Pakistanis holding tickets for the World Cup semifinal. Pakistani Prime Minister Yousuf Raza Gilani has accepted an invitation from his Indian counterpart, Manmohan Singh, to join him in watching the match from a VIP box. 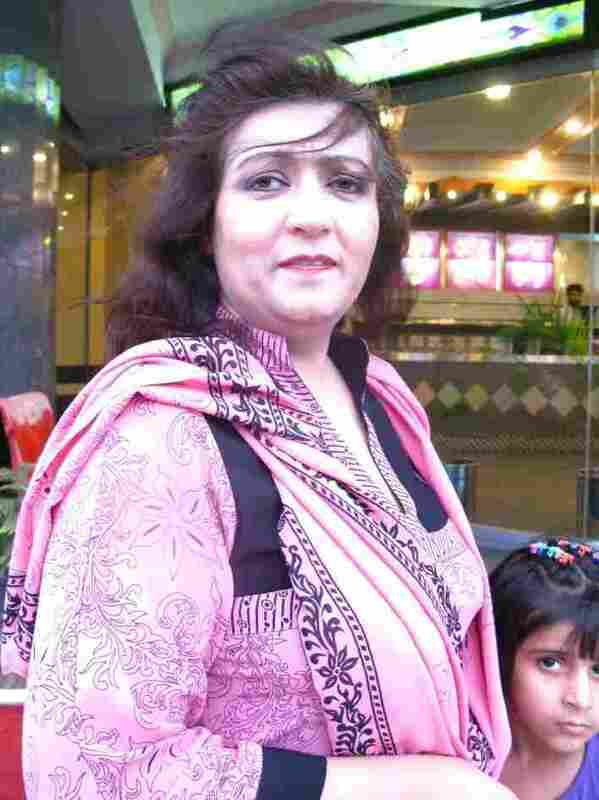 Islamabad doctor Dilawaiz Durrani will be watching from her couch. 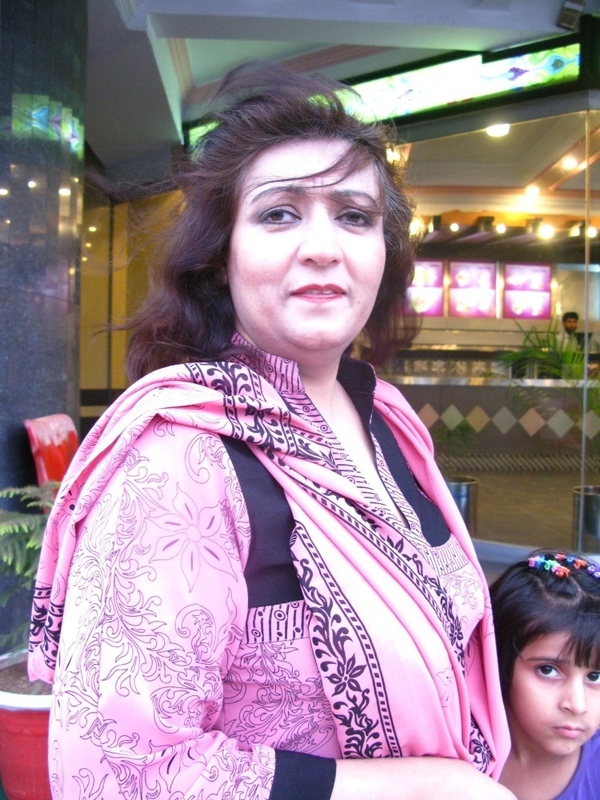 Islamabad resident Dilawaiz Durrani, 38, says Pakistan has high expectations for the semifinal against India. She says "cricket fever" has gripped the country. "We are having cricket fever," she says, laughing. "It's part of our country — the national fever, you know." Pakistan's clash with India is all the more fraught because Pakistan hasn't been allowed to even play in India since the 2008 Mumbai attacks, blamed on Pakistani militants. No international cricket has been played in Pakistan since gunmen opened fire on the visiting Sri Lankan team in Lahore in 2009. This "mother of all matches" could be Pakistan's redemption, says banker Khizar Hayat. "It's a matter of Pakistan's honor. If we win, people will recognize us as a sports-loving nation," Hayat says. "International teams will come back. It will project a moderate image of Pakistan." Right now, Pakistan is struggling with a problem of dishonor. Last month, the International Cricket Council found three Pakistani players guilty of colluding with gamblers to fix certain plays in a test game played at Lords in London in August. India is the favorite in Wednesday's match. The team beat three-time World Champion Australia by five wickets to win the berth. Pakistan arrived in India fresh from thrashing the West Indies in Bangladesh to reach the final four. Team members, politicians and journalists are among the fortunate few with hotel rooms in Mohali. The place has been booked up for weeks. The scene is now set for a potentially explosive match that could trigger riots or worse. Interpol's chief last week credited Pakistan with helping to foil a terrorist plot targeting the World Cup. The hotel where the two teams are staying is now a virtual fortress with more than 1,000 police protecting the players and the visiting VIPs. Pakistani banker Khizar Hayat, 33, says winning Wednesday's semifinal against India "is a matter of honor." Analysts say it's impossible to overstate how important this match is to the national psyches of the two countries. Indian journalist Rahul Bedi says there will an undeclared curfew in both nations during the game. "The streets will be empty, and everybody will be watching the match," he says. "Depending on the outcome, if India wins, Delhi will explode, India will explode in fireworks," Bedi says, "and if Pakistan wins, Pakistan will explode in fireworks." 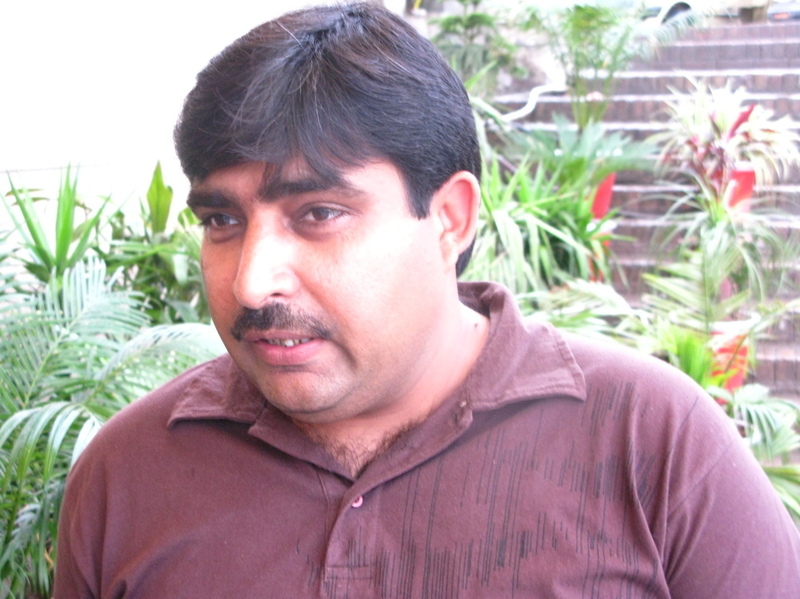 Pakistani author and social commentator Naeem Tahir warns his countrymen that if Pakistan loses, it's not the end of the world. "They don't need to smash windows ... collapse in bed ... or fall into depression and miss work," Tahir says. "This is not a war between two religions," he says, laughing. "It's not a war between two countries. It's a game!" But Bedi says the teams have every reason to fear defeat as much as they crave victory. Once, he says, when Pakistan lost another World Cup match to India, "the Pakistan team had to go literally home through the back door." "They had to sneak out of the airport because there were fans waiting to beat them up. The players had to disappear. I mean, it took them several months to be able to come out and face the public," Bedi says. Pakistan's team captain Shahid Afridi says his bowlers can check India's batsmen. He's hoping to emulate the victory of the 1992 World Cup, when team captain Imran Khan led Pakistan to victory. Indian captain Mahendra Singh — "M.S." — Dhoni is telling his teammates not to be distracted by the media hype. Sports pundits say this match is likely to go to whichever team can best withstand the pressure.